MSNBC’s Chris Hayes engaged in a nasty confrontation with conservative Jennifer Stefano of Americans for Prosperity over the latest ObamaCare delay. After Hayes’ obnoxious jab, Stefano shot back that “Actually, the thing I wake up about and think about every morning is my children.” The next 4 and a half minutes featured Stefano and Hayes arguing about the problems in ObamaCare and whether or not Medicaid should be expanded. Unfortunately, the majority of the interview was spent with the two guests shouting at one another, with Hayes continuously interrupting Stefano whenever she said something he disliked. You are doing is you are working backwards from opposition to the law. Jennifer Stefano, Americans for Prosperity, was not doing anything to get people health insurance, was not concerned about the plight of people on Medicaid… it's not like you care about people on Medicaid or that's the thing that got you into politics. And I don't understand, why not just be honest about it? This is honesty. You know nothing about me, you have no idea what I think in the morning…You don't know what I wake up and fight for and believe in. You know nothing about me or my family…You don’t know if I was born and raised in a trailer park. You don’t know what I did and how dare you, like Harry Reid, try to undercut the voice of a woman simply because she disagrees with you. Now you may not like where I'm coming from on public policy, but you have no right to undercut my voice, as a woman, I have worked very hard. Kudos to Ms. Stefano for not allowing Hayes to shut her down for disagreeing with him over ObamaCare. Rarely does MSNBC bring on an actual conservative to challenge their liberal ideology so Stefano’s appearance was refreshing for the “Lean Forward” network. 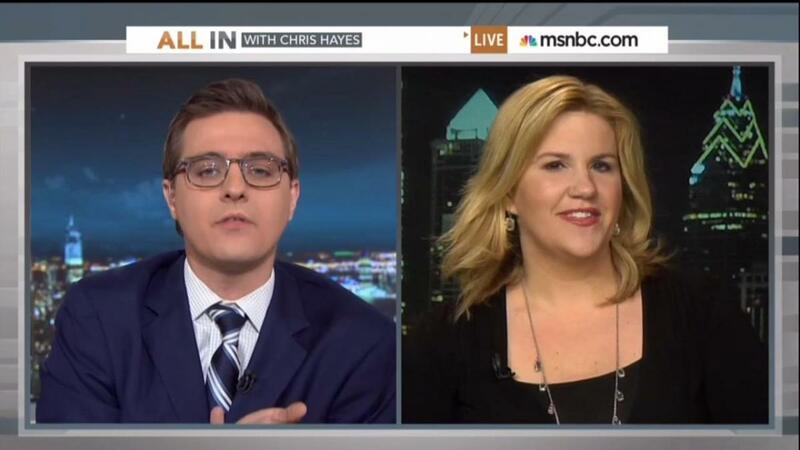 CHRIS HAYES: Joining me now, Jennifer Stefano, she's regional director for Americans for Prosperity. She’s one of those people who I really think genuinely wakes up every day and thinks about how to destroy ObamaCare. And Jennifer the first question is why should anyone care about this extension of the deadline? Who cares? So people are going to have a few more weeks to sign up. JENNIFER STEFANO: Actually, the thing I wake up about and think about every morning is my children, and I think people should care about the deadline for the same reason that I wake up and millions of women – actually 85 million women across the country wake up and think about their children as well. That's how many mothers we have. Because we really are having our choices removed from us as mothers, and the health care that we can provide our children. STEFANO: Why? Because the president lied to us. The president promised us – and a lot of women who voted for him a lot who didn't. STEFANO: He swore to us. He promised. No, no, no, let me finish. HAYES: Jennifer, answer this question first, though. STEFANO: I’m going to answer. HAYES: Why does extending a deadline for two weeks take away the choices you have for your children? Explain that to me. STEFANO: Because it continues to not allow people to go back and change this law. This law has made 7 million people lose their insurance. For the people who have actually signed up on the exchange, the McKinsey Institute, which is a consulting group that tracks these things, nonpartisan, has found only 14% of them are actually people without coverage. People without health care right now, who don't have health care for their children, don't want this law, Chris. It's not helping them that is true. STEFANO: They're not signing up. And as a mother, I take real offense that women are being forced to have no choices to cover their children. They don't want this law. That's why you have to push backthe deadline. You can't get people to pay for it, you can't get people to sign up for it. HAYES: Jennifer what are you talking about? Do we have the chart? Do you realize that millions of people have signed up for this, right? HAYES: No, millions of people have signed up for it. STEFANO: Of what percentage of those people don't have insurance? Only 14%. STEFANO: This is not helping the uninsured. Why will they not sign up for it? HAYES: Wait a second. Jennifer, this is key. STEFANO: Why will they not sign up for it? HAYES: This is key. This is an important point. If what I’m hearing from you is you're worried that not enough people signing up on the exchange are actually people that are not uninsured.And here's an interesting thing about the way this law works. A huge amount of the heavy lifting it’s doing is insuring the uninsured is in the Medicaid expansion. And yet Tea party after Tea Party. STEFANO: That’s fundamentally not true. HAYES: Yes, absolutely true. The estimate -- it is absolutely true that a huge part of the heavy lift in insuring the uninsured is the Medicaid expansion. So take this from me. Answer this question for me. Throw out the mandate, throw out the exchange, throw out the deadlines you don't like, forget about all that, okay? Bumping up Medicaid eligibility from 100 percent of poverty line to 133 percent of poverty line so that some working poor people can get some health insurance, what is the objection to that, why does every conservative Republican governor oppose that, explain that to me? STEFANO: Number one, not true. Plenty of Republican governors, including Tom Corbett in Pennsylvania, including the Ohio governor, there are Republican governors that have expanded Medicaid so-- please, please, please. HAYES: Wait a second, do you like that? STEFANO: Spare me this is a Democrat Republican thing. Number one it's not. HAYES: I want to hear what you say. STEFANO: Number 2. Let me finish answering your question. HAYES: Jennifer I want to hear what you believe. Do you believe in Medicaid expansion? HAYES: Not on the Medicaid expansion. STEFANO: Not an economic one. HAYES: That's a math train wreck. That's not the Medicaid expansion. HAYES: It's not the Medicaid expansion. HAYES: But wait a second. Here's the thing. STEFANO: How poorly people on Medicaid suffer. HAYES: Jennifer, this is what’s crazy. Here's what you're doing. Jennifer, here is what you're doing. HAYES: Here is what you're doing. And this is precisely what I was saying in the intro. HAYES: No, what you are doing is you are working backwards from opposition to the law. Jennifer Stefano, Americans for Prosperity, was not doing anything to get people health insurance, was not concerned about the plight of people on Medicaid. STEFANO: How do you know that? HAYES: Was not sponsoring bills before Congress, was not trying to get people health care, what happens now is that any part of the bill, any part of the law that can be picked apart to try to destroy it, suddenly the great saviors of the working poor, or people on Medicaid, are people opposed to thelaw. But the fact of the matter is, that is not the animating thing that is making people get up in the morning and go to work war ObamaCare, it's not like you care about people on Medicaid or that's the thing that got you into politics. And I don't understand, why not just be honest about it? This is honesty. HAYES: Why not just be honest about it. STEFANO: You know nothing about me, you have no idea what I think in the morning. HAYES: No, we have talked before. STEFANO: You don't know what I wake up and fight for and believe in. You know nothing about me or my family. HAYES: So you were working on Medicaid expansion? HAYES: I put you on my TV show, I'm not undercutting your voice. STEFANO: You're undercutting my voice, because you're making it personal. Saying I wake up to do this. And this is what I--you have absolutely no idea about me or my life. HAYES: What do you want to see? How do we get people health insurance? STEFANO: Stick to the facts, talk about facts, logic and reason.How dare you personally attack me and what I believe. Typical because you can’t win brother. Unfortunate. HAYES: I'm not personally attacking you, Jennifer. Jennifer, thank you. Thank you for coming on the show. I do appreciate it. STEFANO: Sad Chris. You're a good guy otherwise. aCare delay.